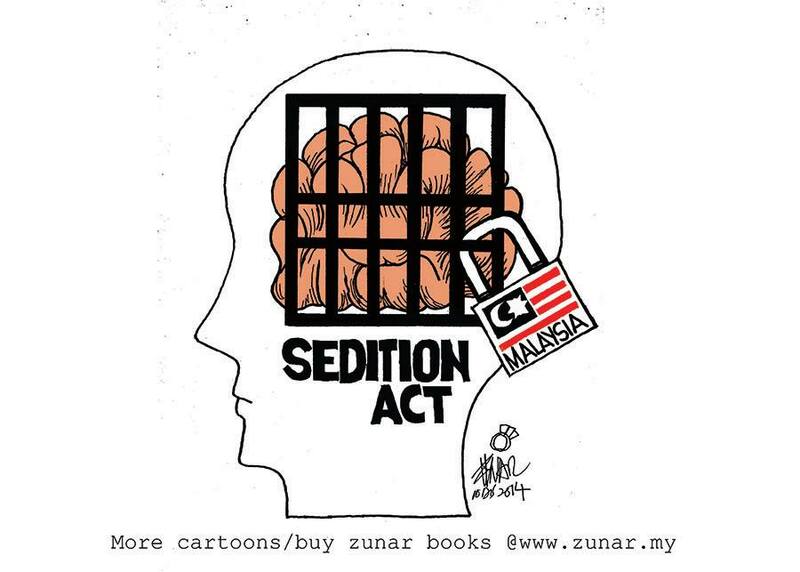 The sedition trial of Malaysian cartoonist Zunar, which was set to begin today, has been delayed yet again as he and two other defendants launched another challenge to the country’s Sedition Act, a vestige of Malaysia’s colonial past. A court decision to be handed down on December 15 will determine whether the challenge can proceed. A previous challenge from law professor Azmi Sharom, also charged with sedition, held up the start of Zunar’s own trial for several months. Azmi’s legal team had argued that the Sedition Act should be invalid since it predates the Malaysian constitution and independence from British colonial rule. Last month, however, a five-judge Federal Court panel ruled that the law would remain in force. Dissenters like Zunar and Azmi say that Prime Minister Najib Razak’s government has selectively used the Act as a tool to silence opposition. Zunar’s lawyer Latheefa Koya, who also represents the other two challengers Eric Paulsen and N. Surendran, is asking for a court to review the decision in the Azmi case as well. The new challenge from Zunar and the two other defendants takes a different legal tack, arguing that the Sedition Act is unconstitutional because it does not require the government to prove the defendant’s intent was actually seditious. Questions of intent are also commonly debated in U.S. free speech cases, most recently in Elonis v. United States where the Supreme Court decided prosecutors must show that menacing language was actually intended as a “true threat” before it can be exempted from First Amendment protection. While waiting once again for Zunar and other Malaysian dissidents to receive true justice, please take a moment to sign the International Federation of Journalists’ petition calling on the government to drop the charges against him. Cartoonists Rights Network International also provides a convenient form letter to send to Malaysian embassies.